Dad, mom and I just got back from a trip to Captiva Island, Florida. What a beautiful place! We met our friends, Dave and Shirley and their son Aaron’s family, and had a very relaxing week. Sitting on the beach with my toes in the sand, swimming in the Gulf and the pool were the highlights of the week. 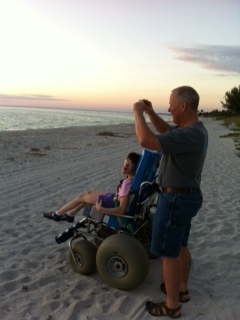 We rented a beach wheelchair that had great big rubber tires that would go anywhere on the beach, even floating in the Gulf. I came home with a sack full of sea shells that we collected and a lot of great memories. This is sooooooooooooo cool. And thanks for the picture so I can see this beachcomber wheelchair! That is so great! I’m surprised you didn’t mention your Harry Potter scarf and shirt 🙂 I love them! What a beautiful memory of the sunset on the beach!